QUOTE | “Never fear! 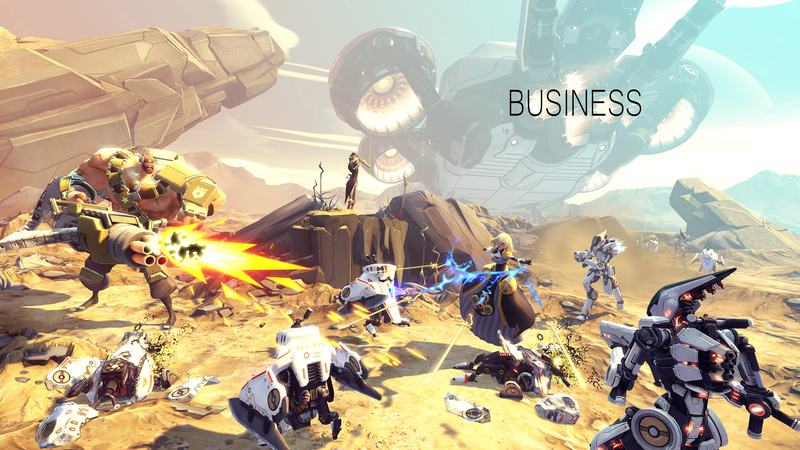 Battleborn is here to stay.” - Battleborn creative director Randy Varnell, immediately after announcing that the Fall Update is the final planned content for the game, and immediately before announcing he’s going to work on some other project now. QUOTE | “I would have liked to see them leave it on.” - Microsoft head of Xbox Phil Spencer, reacting to Epic Games’ removal of Xbox One-PS4 cross-platform play from Fortnite after it was accidentally enabled last weekend. QUOTE | “This was never discussed with us and we don’t feel that it’s right.” - Bluehole VP and executive producer Chang Han Kim is upset that his studio’s hit PlayerUnknown’s Battlegrounds was so clearly ripped off by the Battle Royale mode in Epic Games Fortnite, a situation made more concerning by the two companies already having a business relationship that sees Epic get a cut of all PUBG sales since the game was built on Unreal Engine 3. QUOTE | “I fear that we’re in danger of talking ourselves out of VR and AR, which is going to be a fundamental category in all walks of life over the next few years.” - Mercia Technologies’ Mike Hayes is concerned that investors are losing faith in VR and AR prematurely. QUOTE | “I definitely think we will see some companies running out of venture capital, even really great companies that just didn’t have the luck or the timing to sign deals and stay in business until the hardware is good enough to support a big enough consumer group.” - Resolution Games’ Tommy Palm is still a believer in VR, but isn’t sure how long his mobile VR company will have to tread water before there’s a viable consumer marketplace to support him. QUOTE | “I can honestly say this is the single hardest way to raise money that I’ve ever seen.” -Altara Games founder Ella Romanos says the bubble has burst for crowdfunding sites like Kickstarter. She believes cryptocurrency is the next big fundraising tool. QUOTE | “In short, review bombs make it harder for the Review Score to achieve its goal of accurately representing the likelihood that you’d be happy with your purchase if you bought them. We thought it would be good to fix that, if we could do it in a way that didn’t stop players from being able to voice their opinions.” - Alden Kroll explains how Valve is addressing poor behavior by adding a graph to the store page. QUOTE | “Players whose Xbox Live reputation has been downgraded to ‘Avoid Me’ will remain in the same matchmaking pool as other Overwatch players. However, they will no longer be able to use the in-game voice communication.” - Patch notes for Overwatch explain how Blizzard is addressing poor behavior by creating consequences for being a jerk..
STAT | ¥42,380 - The high mark for Nintendo’s stock price this week. It hasn’t been that high since October of 2008, in the midst of a global financial crisis and just before the launch of Wii Music. STAT | 4 - Days it took Divinity: Original Sin 2 to reach 500,000 copies sold. The original Divinity: Original Sin took “two or three months” to hit that number. QUOTE | “If the game industry has proven anything, it’s that you can’t just start throwing people at the problem and scale up proportionately to the level of headcount you hire. Every company that’s tried that has basically failed.” - Disruptor Beam CEO Jon Radoff explains why the studio wants to grow organically rather than scale up quickly in the wake of mobile hits like Game of Thrones: Ascent and Star Trek: Timelines.